It was our second day in Eureka Valley and we had two 5-6mi loops on the day's agenda. Or so I thought. When I awoke in the morning, Brian wandered over with his Death Valley book and suggested there was this Marble Mtn in the Last Chance Range that we might want to check out. I looked up the distance and other stats on TOPO!, found it to be about 10mi roundtrip and agreed immediately. We were going to be done a day earlier with the current agenda, so having something new was most welcome. It turned out to be a fantastic day, with easy scrambling, fine ridge hiking, two additional bonus peaks we hadn't planned on and a totally unexpected slot canyon with a bunch of petroglyphs, with weather that was superbly cooperative. What more could we ask for? Well, we hoped to thumb a ride on the way back but we never saw another person, let alone a vehicle. Can't have everything, I suppose. We drove up Dedeckera Canyon to where it narrows considerably, the same spot we had investigated the day before while trying to drive to Saline Peak. The wide and long wheelbase of Brian's truck was not conducive to the narrow canyon with 4-5 significant steps that needed to be negotiated. The route is better suited to vehicles like Jeeps Wranglers. We parked the truck and walked about two miles up the road before striking off to the left to head cross-country towards Marble BM. It was entirely overcast when we had awaken in the morning with the higher summits mostly buried in the clouds, so we weren't expecting much in the way of views today. But as we started up the broad valley slope, we noticed some blue sky which improved over the next hour, eventually leaving the clouds mostly confined to the mountaintops. We climbed about 1,000ft over 2mi as we ascended the uniform slope of the valley with excellent footing and easy walking. At the base of the mountain we entered a small, narrow wash before climbing out onto a ridge we'd picked out for the ascent, which would require about 2,000ft of climbing over 3/4mi - where the real work begins. The West Face of Marble BM has several cliff bands but these are broken in places by steep ridges. We chose one that went most directly to the summit, finding it far easier than it had looked from below. The rock is metamorphic in nature, mostly limestone, a far different experience from yesterday's volcanic hike to Eureka Peak. It took us 2.5hrs to reach the summit, better than we might have guessed. We found ourselves enveloped in clouds with nary a view, a chilly wind blowing over the crest which sent us scrambling for more clothes from our packs. Along with the expected benchmark, there was an ammo box (courtesy Greg Vernon) that held a register left by a MacLeod/Lilley DPS party in 1976. The register had more than 30 pages of entries, about 20 more than I might have expected. Why is this non-DPS peak in the middle of nowhere so popular? Partly it's due to the 4WD Mines Rd that comes up from Death Valley Rd to the northeast, making the hike to the summit just over a mile - not bad at all. Rather than head back down, I suggested we might continue south on the crest to the bonus Peak 7,774ft about 1.6mi in that direction. It wasn't yet 11a so Brian readily agreed and off we went. 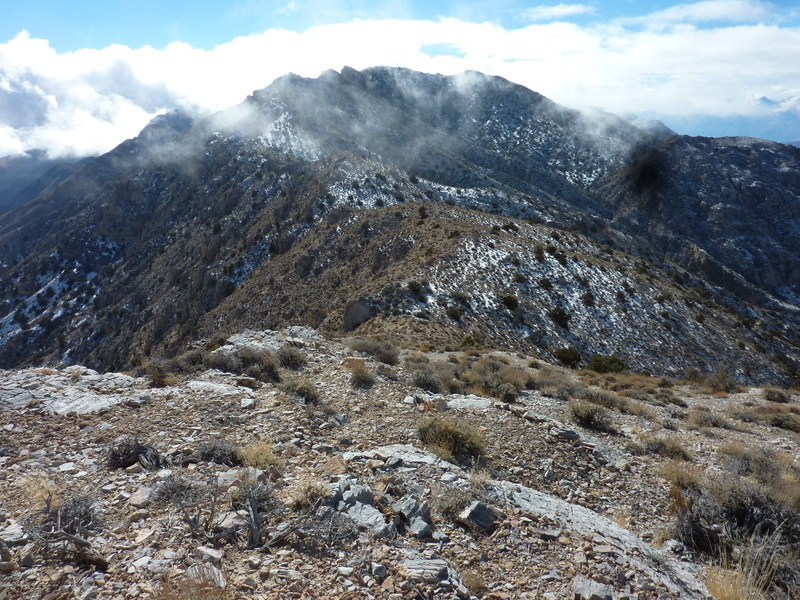 As we hoped, the clouds began to disperse more as we started off along the ridge, eventually rewarding us with incredible views east to Death Valley, Ubehebe Crater and the Cottonwood Range, as well as west to the Saline and Inyo Ranges, the latter bedecked in snowy fineness. There was some snow in the Last Chance Range as well, but it was never more than an inch in thickness, mostly relegated to the northern aspects and mostly just providing nice contrast for our photos. The hiking along the crest was mostly an easy stroll, made easier with deer/sheep trails and only occasionally requiring some short sections of class 2 to negotiate. It took us about an hour and a half to make our way between the two summits and we were having such a good time that we decided to continue on to a third, higher summit another 1.7mi to the south. At over 8,000ft, the ridge begins to support a small collection of junipers with a sprinkling of pinyons just below the summit of Peak 8,129ft. We found no registers atop either peak (though I knew that Bob Sumner had visited the higher one), and without materials to leave one ourselves, we left them pretty much as we found them. At nearly 8,700ft, Dry Mountain, the Range highpoint, rises almost 5mi further to the south, much too far for us to consider continuing along the ridge. There are several other bonus peaks in-between, but the nearest was 2mi away and it was already 1:30p. We had traveled some 9mi so far and it was time for us to head back lest we be returning in the dark. We dropped west directly from the summit, descending to a sandy drainage that turned out to be a spectacular find. It's sandy bottom had enticed us off the ridges, but it soon began to narrow, eventually becoming as constricted as 6-7ft with walls towering hundreds of feet on either side. I was half-afraid we'd run into an impassable dry waterfall, but Brian reminded me that we'd seen both animal and human tracks during the descent which strongly suggested others had climbed up this way. As we were admiring the vertical rock walls and the numerous caves and bird havens they contained, I was about to comment something to the effect of, "What if we found some petroglyphs here?" when I suddenly spied the very things I that I was just musing about. There were hundreds of such figures on at least five different walls that we examined in the canyon. What a find! We took pictures and marveled at the ability of the native americans to live in such a hostile environment as Death Valley. As the canyon narrowed further below the petroglyphs, we found two short drops that required us to pause before descending, the canyon eventually opening back up futher down. It was after this that we came to the idea that the canyon was probably used by the native americans to herd deer/sheep/rabbits into one end of the canyon, only to be trapped by other indians waiting at the other end. It would take quite a bit of cooperation and coordination, but the bounty might be more than worth the organizational effort. I had hiked Marble BM from the East a few days after you guys. I had hoped to drive up the road some like you mention, but no such luck for me. The way the main road was grated/plowed piled up dirt that blocked entrance to the minor dirt road leading off towards Marble BM. Even if you got past that (which is likely possible in the right vehicle), significant portions of the road are entirely gone after maybe just a few miles in, washed away by flash floods. Turned out to be an 18 mile hike from the East. Neat to see the snow free photos from your hike. Marble BM was covered in snow after the next storm, making for a tough hike on the 21st.